Congratulations to PSD's William "Bill" Otto, who was recently awarded a NOAA Silver Sherman "for an unwavering positive attitude and exemplary dedication to the implementation of safety procedures across the ESRL Physical Sciences Division. Each day he works tirelessly and effectively to develop, enact and enforce safety procedures to address a spectrum of safety risks challenges that extend well beyond office and laboratory environments to include observing system development activities and world-wide field deployments." The Silver Sherman Award recognizes NOAA employees who excel at their jobs, achieve a milestone that contributes significantly or critically towards a particular program’s goal, or demonstrate leadership toward process improvement of a significant magnitude. Otto's career at NOAA spans more than 40 years and a variety of positions including NOAA Corps Officer. He is currently an administrative specialist at PSD, whose duties include that of safety officer. 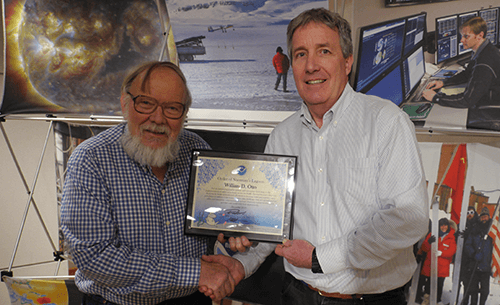 Bill Otto (left) receives NOAA Silver Sherman Award from PSD Director Robert Webb.